I am not one of those people who are blessed to sweat odorless. I sweat and I smell. Simple enough. I was a bit worried of switching from my normal strong deodorant to a more natural one thinking things would start to get a bit musty by mid morning. 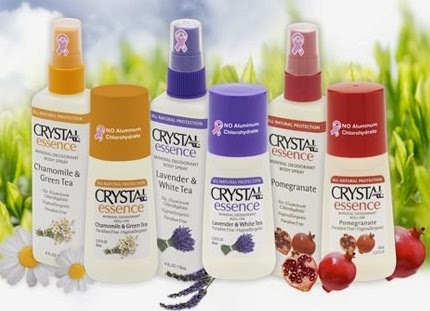 Still I decided to give it a whirl and picked up these from Crystal essence. I was drawn in by the little pink breast cancer ribbon on the top because it is one of the causes I am very passionate about. Now I have heard, like many of you, that certain ingredients in deodorants can cause breast cancer. I am not a scientists or any kind of professional in that field but if I can avoid certain things that may or may not cause cancer then why wouldn't I at least try it? These products contain no aluminum chlorohydrate, aluminum zirconium, no parabens,and no phthalates. I apply it at night after I shower because I am a sweaty sleeper. Fun! And again in the morning when I get ready to start my day. I have been using them for about 4 months now and I am very pleased with them. They hold up to a regular day in my life with temperatures no higher than the mid 80's. We haven't hit higher temperatures in Texas just yet and I assume that will be the true test but again I am happy with these. They don't stain my clothes or my underarms and the scent is very light and pleasant. One thing they do not hold up to my long runs but really what does? That is what I consider an extreme and let's be honest I don't run marathons on a daily basis although some days it sure feels like it.